A history of change lies along the shore of the Duwamish River. For over a thousand years, the Duwamish River has meandered through the narrow landmass we now call South Seattle. Indigenous tribes lived along the river since at least 500 CE and used the Green Duwamish Watershed to hunt ducks and geese, fish for salmon, cod, and halibut, harvest clams, and gather berries and camas. It is likely the river shifted course over those centuries, flooding and contracting within natural processes. As European explorers moved in, the river was straightened and the 20th century’s industrial manufacturing and urban development took over. 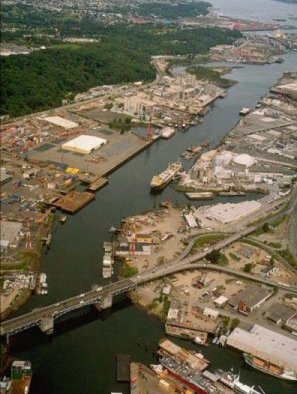 Pollutants collected in the muddy bottom of the Duwamish and it was ultimately declared a Superfund site in 2001. In the decades that follow, community groups bring the watershed alive through ecological restoration and cultural reconnection. Several environmental, tribal and community organizations have joined forces the past two decades to enact large-scale legal, industrial and environmental changes. The Duwamish River Cleanup Coalition, the “Community Advisory Group” for the Duwamish River Superfund site, includes the Duwamish Tribe, the Community Coalition for Environmental Justice, and People for Puget Sound. Several organizations have since developed over the past five years as an outgrowth of the Coalition and Seattle Park District funds, including a few new Green Seattle partners. The Green Seattle Partnership supports Forest Stewards, local environmental organizations and professional crews in their work along the shore and upland from the Duwamish. Upland forested areas along the greenbelts of West Seattle and Beacon Hill filter pollutants that accompany urban development. These pollutants are likely to persist long after the Superfund cleanup is complete. A healthy urban forest bolsters the Duwamish River’s recovery. In 2016, Green Seattle volunteers and crews installed 17,000 native plants within the greenbelts of the Watershed. The Duwamish Watershed represents a large portion of Seattle’s geography; a bulk of all Green Seattle restoration across the city occurs in these greenbelts. Over 5000 volunteer hours in 2016 came from the hard work of several partner organizations. 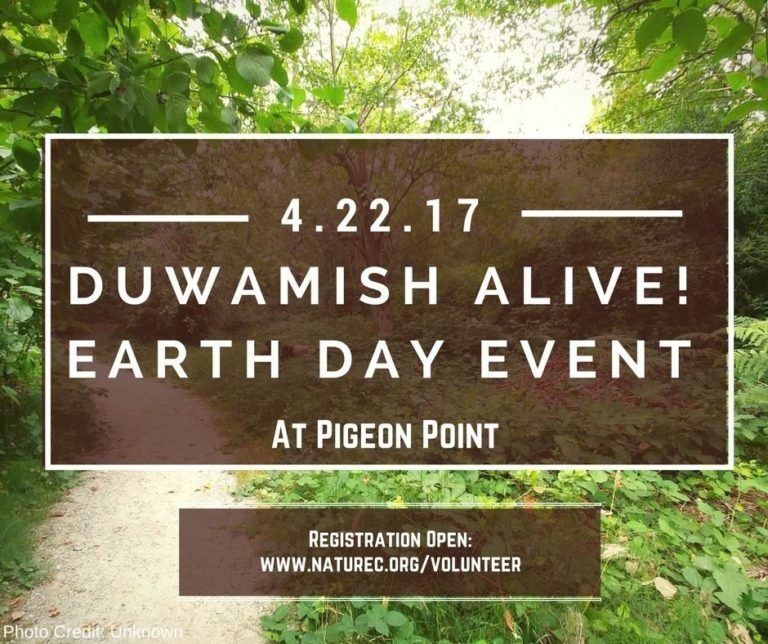 Nature Consortium, EarthCorps, and Duwamish Alive! lead volunteer restoration projects throughout the Watershed. Some of the most active restoration sites are Pigeon Point, Soundway and Riverview, Longfellow Creek, and Herrings House/T-107. Coming up on Earth Day 2017, these three organizations are co-hosting a fun and vibrant volunteer work party within Pigeon Point. Duwamish Alive! also invites all to join them on land and in the water along the banks near Terminal 107. “On Earth Day, 18 different habitat sites throughout the watershed will be included as part of a water microplastics study conducted by Puget Soundkeepers with their DAC partners. As plastics break down, toxins adhere to them and settle in the bodies of aquatic animals and vegetation. Herrings House and T-107 are primary Duwamish habitat sites. Because the river has been channelized and the banks are armored, very little viable habitat exists for juvenile salmon coming down the River and to Puget Sound. These sites sit at the mouth of the Duwamish; native sedges we’ve planted provide shelter and food source. The Green-Duwamish River is one of the few that has salmon runs for all five species!”- Sharon Leishman, a Green Seattle Forest Steward and Duwamish Alive Coalition Coordinator. Green Seattle partners with professional crews to work along the steep slopes of the East and West Duwamish Greenbelts and the sensitive wetlands along the Duwamish shores. Green Seattle Partnership, Duwamish Alive! and the Duwamish River Cleanup Coalition are a few partners who financially support the burgeoning green job employment sector. DirtCorps and Duwamish Valley Youth Corps are new local organizations that provide paid employment, ecological restoration training, and leadership development to teens and young adults. These employment programs provide meaningful economic pathways, reinstate the historic human connection to the Duwamish, and establish a strong community voice for the environmental health of the Duwamish. In addition to impressive work throughout the Duwamish Valley, DirtCorps crews support Green Seattle Partnership projects in Westcrest Park. Joining a stewardship project along the Duwamish, or leading your own, is one way to strengthen the human connection and restoration of this valuable Puget Sound ecosystem. Several forested areas along the West Duwamish are in need of Forest Steward leadership: a natural area along Othello St. at Highland Park Way, Westcrest Park, and Puget Park. Green Seattle Partnership restoration sites across the city can be viewed on the public ArcGIS reference map. Connect with Green Seattle at an upcoming Earth Day event or contact the Partnership to learn more about Forest Stewardship. Elizabeth supports the Green Seattle Partnership through her consulting firm Our Future Environment and as a St. Mark’s Greenbelt Forest Steward. She provides services to integrate the benefits of natural, restorative, digital, and open spaces in urban environments.